Hello, I’m Max, and this is my friend/Mum, Sasha. I’m 13, and I’m the one with the brown and white coat – Sasha has the nice red and white coat, and she’s 15! Yes, I know she doesn’t look it – we’ve got good genes, you see. We have lost our home recently – well, our family moved away for some reason and left us behind, even though we don’t think we did anything wrong. There were lots of us at home: small children, another dog – one of those husky types – and a cat, and we all got along very well – but we don’t know where they are now. We are always pleased to see people and we show our appreciation by rolling over to let them rub our tummies. We wag our tails a lot too, of course. If you prefer, we can always put our front paws on your lap and give you a lick on the neck? Whatever you’d rather. We love to have a little run in the field, it makes us very happy. I like running a bit more than Sasha. We never argue. I hear that dogs sometimes fall out, over their balls or their food or something, but I can’t imagine falling out with my Sasha, in fact I miss her the moment I cant see her! Sasha has a little lump on her neck, but she says it’s only a fatty lump and nothing to worry about. Apart from that, we are as fit as two fiddles! We’d love to find a new family to adore. We think we could live with children, and cats, and probably even other dogs, as long as we were introduced properly, as we’ve done all that before and we know what it’s like. Oh, but of course, we have to stay together. Max and Sasha will be neutered, vaccinated and microchipped . 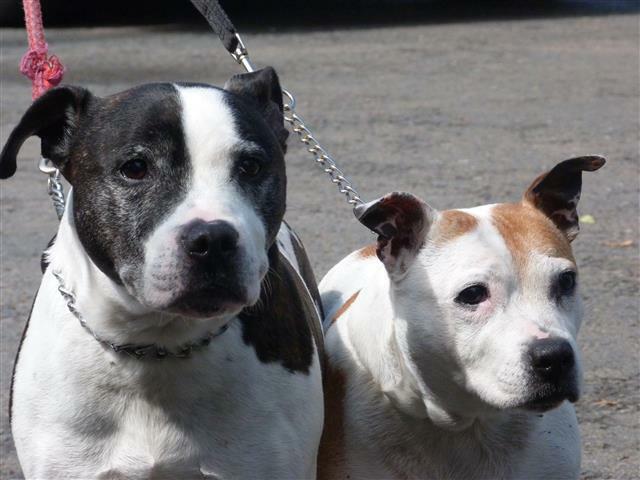 They are in the Shropshire area but can be rehomed anywhere in the UK, pending a successful home visit. However any adopter should be willing to travel to meet them where they are now.